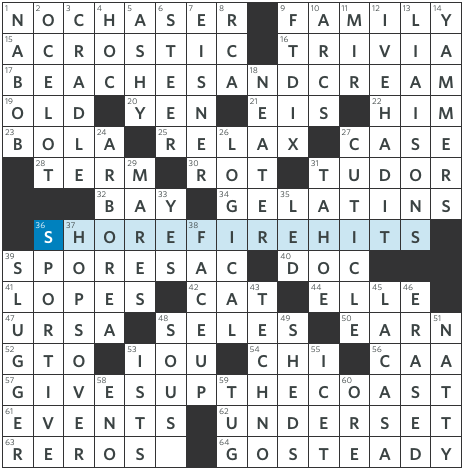 If you subscribe to Liz Gorski’s Crossword Nation puzzle, you read her note this week about spoilers. Spoiler: she hates them. I understand why, although I don’t always share her opinion. This puzzle nudged me closer to her side. Not only does it explain the theme (which was clear to me) but it also explains the grid. Leave us something to discover on our own! So the theme: four of the answers are incomplete. 1a [Insect made of paper] only has room for ORIGAMI. That clearly wasn’t enough. I was wondering about a rebus. 8a [Puccini opera] is MADAME and that is missing the same word as 1a. Aha! 65a [One going from party to party] is SOCIAL. 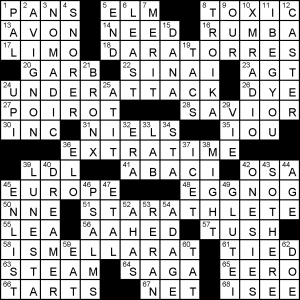 And the revealer, in the center: 35a [Word that must be added to 1-, 8-, 65- and 66-Across for their clues to make sense [with a visual hint in the grid] ] is, of course, BUTTERFLY. I like 3/4 of the theme, but not the revealer. It makes me feel as if Will and Bruce couldn’t stand to have any of their creation go unappreciated so they had to spell it all out for us (literally). The 1/4 of the theme I don’t much like is MONARCH which, unlike the others, is an actual butterfly, not a metaphor. Don’t get me wrong – I love monarch butterflies. I don’t like inconsistent themes. 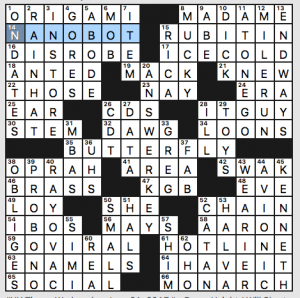 14a [Microscopic machine] is a NANOBOT. Fun to find in the puzzle. Not sure it would be fun to find in real life. 17a [Phrase in beer ads] is ICE COLD. Well, yeah, but it’s also a phrase out of beer ads. 20d [Test grader’s need] is an ANSWER KEY. 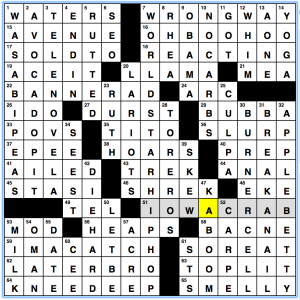 Test graders need them; crossword solvers should not. 29d [Pole workers’ creations] are TOYS. It took me a while to realize that the pole in question is the North Pole. What can I say? Santa never came to our house. A baseball pair at 56a and 58a: MAYS and AARON, clued with their placement in the home run record books (5th and 2nd, respectively). What I didn’t know before I did this puzzle: that Legal Aid in PA is funded partly through pooled interest on some small or short-term escrow accounts (I had to go outside the grid for this one). Only three themers today, each with a word changed to give us a seaside pun to put us in a summery mood. 17a [Two favorite things for “Sunshine of Your Love” fans?] BEACHES AND CREAM. Peaches… The song is the 1968 big hit from Cream, but I haven’t figured out what it has to do with beaches. 36a [Music to accompany cookouts by the sea?] SHORE FIRE HITS. Sure… This one’s a groaner. 57a [Heads home after a day by the ocean?] GIVES UP THE COAST. …ghost. The pun is okay, but it’s inconsistently at the end of the phrase unlike the previous two. So I’m afraid the theme doesn’t do much for me. What about the fill? Well, the top half is pretty good, the bottom half not so much. Up top we get NO CHASER, ACROSTIC, and “I’VE HAD IT!” Down below we get CAA, UNDERSET, SPORTIVE, and REROSE. To be fair, there’s SLUGGER and GO STEADY as well, but that’s not enough to overcome that really rough stuff. ARBOREA (ugly) and CUTICLE (nice) split the difference in the middle. I have no idea what CAA is [Co. co-founded by Michael Ovitz]. *reluctantly searches internet* Okay, it stands for Creative Artists Agency and it represents various artistic and sports talents. Not great fill; I could go without seeing that in a grid for quite a long time. And then there’s ARBOREA [Forested plane in Dungeons & Dragons]. According to Wikipedia, “The Olympian Glades of Arborea is a chaotic good-aligned plane of existence.” I take it that’s not common knowledge. On the whole, this was a very uneven solve for me with a spotty theme and too much less-than-savory fill. The theme is pretty basic. ISMELLARAT is the revealer, and the trigram RAT is hidden in several long across answers. I speak under correction, but the letters RAT are quite common, so I’m surprised at how basic the entries are: DARATORRES, the first, is perhaps the exception; the others are UNDERATTACK, EXTRATIME, and the fairly arbitrary pairing of STARATHLETE. The fill at least, as typically with Ms. Burnikel, had a lot of interesting grace notes: XMRADIO, AVIGNON, GLUTEI, ONESIES. Happy first official day of summer, everyone. Hope the weather in your neck of the woods is as fresh and summery as it is in Boston today. Let’s dig into this week’s AV club, a tasty themeless from Kameron Austin Collins. Let’s talk about this grid, because it’s gorgeous. Kameron’s grids have a lovely visual sense, with carefully placed black squares that are then supplemented by equally great fill that pulls from every possible subject matter. We’ve got some great corners going down in the upper left and lower right, with WASABI PEAS, AVOCADO PIT, and TELENOVELA in one corner and BURNER CELL, BREAK A NAIL, and APPLE BETTY in the right. I have a hunch more than a handful of solvers will have never gone to WORLDSTAR HIP HOP dot com and complain about it, but OH BOO HOO. You’re REACTING the WRONG WAY and it’s a great center column to build a grid around. Other things I liked in this grid: “Divine collaborator, frequently” as clue for John WATERS, LLAMA spit, learning that one of the SHREK films competed at Cannes for some reason, the IOWA CRAB tree, BACNE (that’d be back acne, for those not up on their portmanteau), KNEE DEEP, and a guest appearance from Dr RUTH the sexology expert. Excellent work as always, Kameron! This is exactly what I want from a themeless puzzle. This entry was posted in Daily Puzzles and tagged Alice Long, Bruce Haight, C.C. Burnikel, Kameron Austin Collins, Mike Shenk. Bookmark the permalink. Is ORIGAMI BUTTERFLY a legit phrase? When I typed “origami b” into Google, it listed “origami box” and “origami bird” before “origami butterfly.” Can’t you make hundreds of things and animals using origami techniques? Yes, and cranes are more of a classic because they’re easier to make. I have friends who are seriously into origami and one of their butterflies is sitting here looking at me, so I may have a skewed idea of how often this is used. Sounds like GREEN PAINT to me. MADAME Butterfly is the story on which Puccini’s opera MADAMA Butterfly is based – since I had an A there, and IT PRO instead of GUY (my good friend is an IT pro, and she’s not a guy), that corner gave me a little trouble. The little butterflies in the puzzle were kind of nice. My husband and I recently visited a butterfly garden which was filled with beautiful flowers; there were MONARCHs, and a really cool moth called a hummingbird moth. So this puzzle was kind of timely for me. Thanks! Thanks for pointing out IT GUY, Lise. I meant to write about it and lost track – I should take notes as I’m solving, but then I’d slow myself down….it is a sexist assumption. I left the last letter of MADAM_ blank until I did the crossing because I wasn’t sure which they were looking for. Today’s AV Club might be my favorite KAC puzzle yet- slightly easier than some of his others but amazingly good fill. Seconding the comment about the awesomeness of today’s AVCX. Amazing puzzle. I subscribe to the aries puzzles and can attest to their righteous wonderfulosity. I’ll be getting the EP for sure! Add one more vote for the amazingness of the AVCX! Re: WSJ. I don’t understand CASE as answer to 27A. I hope someone explains. Thanks. CASE is used here in the linguistics sense, in the declension of nouns. Possessive is a case, for example. Here it’s the objective case, where the noun is used as a direct object. Hope that helps a little. Perhaps a linguist could weigh in. “ARBOREA” in the WSJ was a new one for me. My D&D experience was long, long ago, and was minimal even then. Some of KA Collins’s puzzles have been known to bludgeon me to death, but his one was a breeze. Great work, thanks. NYT Agreed with previous dings on MADAMA and the theme in general – also IBO is obsolete for the Nigerian people (IGBO). This bit of crosswordese needs to be retired. I agree completely on IBO. All the Nigerians I know use Igbo.